Manicure is an essential process without which you may lose the beauty of your nails. To keep your nail fresh and shiny with no damages and cracks on them, you need to take care of them on a regular basis or at least give them a complete manicure with regular intervals as per your nail health and conditions. A manicure kit should be your go-to solution when you are always on the go because it comes with nail clippers, cuticle removers, cuticle pusher and other such tools to make sure you stay away from nail damaging conditions no matter where you are and what you are doing. With a handy kit of small yet essential tools keeping your manicure results last is a good thing to do for sure. To find the best manicure kit, you have to know the best brands, most important tools you would need and the quality of the tools that are included. On the basis of these things, you can find the manicure kit that serves the purpose quite effectively. 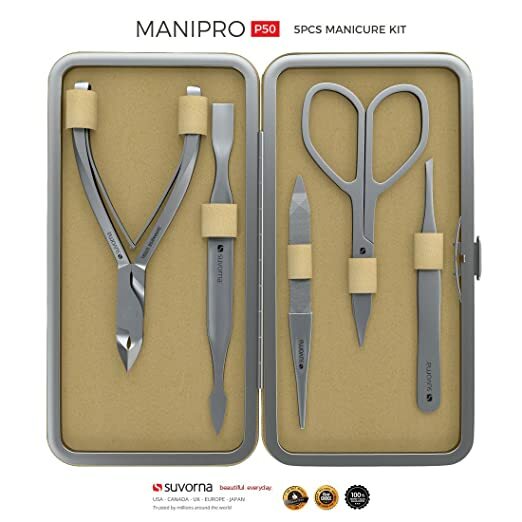 Suvorna manipro is one good option if you are looking for a high grade, premium level manicure kit to keep in your pocket with you. This one offers precisely designed tools that make sure to give refined looks on your nails to keep them looking maintained in a good way. 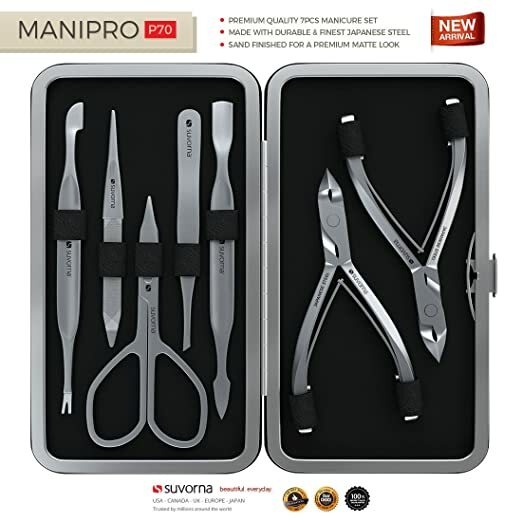 The kit includes 3.5 inches cuticle and nail scissors, having a curved cutting blade design, one standard sized high0quality nail clipper, 3.75 inches tweezers with a slanted tip and 4.5 inches metal nail file and 4 inches cuticle nipper, having r[precise jaw finishing. The tools are finished with smooth and rust free polish for long-lasting performance. 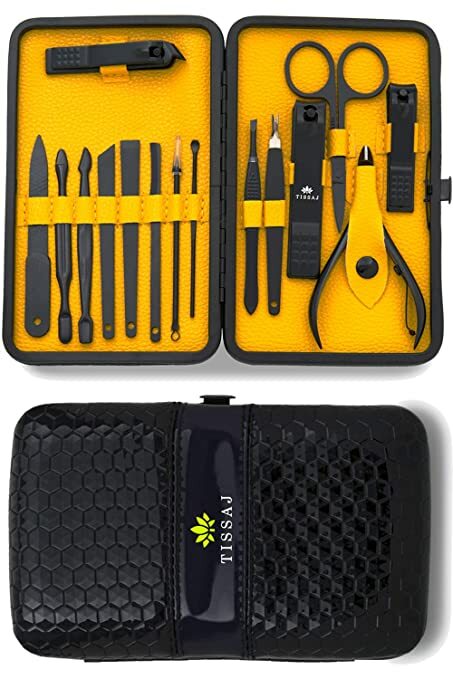 These tools come in a kit form inside a leather case. 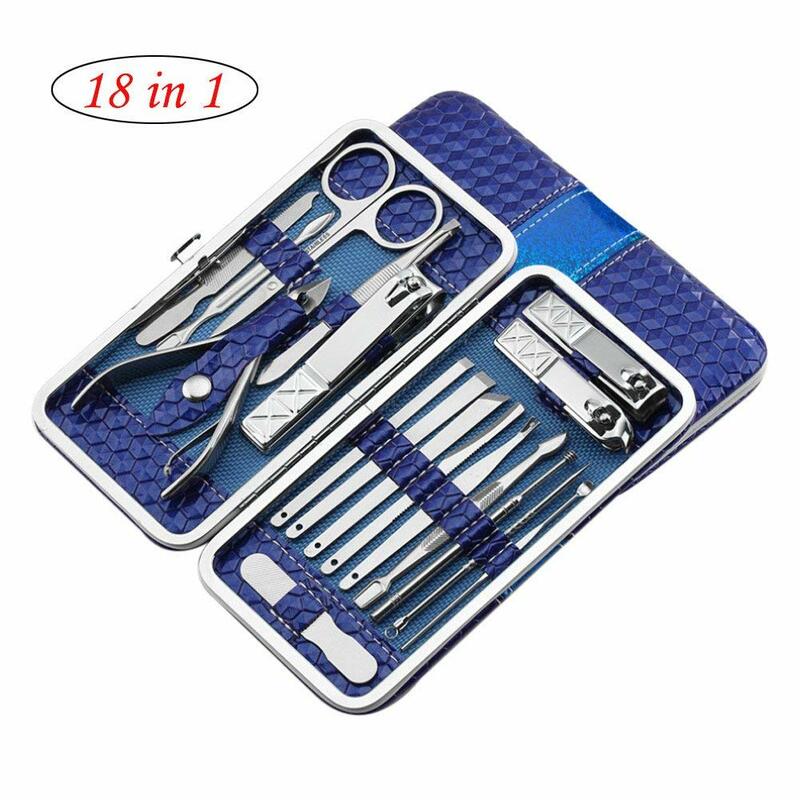 A complete manicure set consisting of 18 pieces in one pack. This kit includes all the essential tools for your nail maintenance and keeping your nails look manicured. This include cuticle trimming tool, scissors, nail clipper with a diagonal design, eyebrow tweezers, loop remover, double sided and single-edged pusher, peeling blade, file, blackhead needle, v-push stick and an ear pick as well. The whole kit is packed in a portable pack so that you may keep it along with you. The tools are made up of easy to sterilize, quality made stainless steel material that is resistant to corrosion and keeps on providing quality finish on your nails. The kits help in avoiding nail splits and cuticle issues. It comes with a 100 percent money back guarantee as well. This is another Suvorna Manipro with all the essentials that you must need to keep your manicure fresh and last longer than usual. This one consists of 7 pieces manicure tools which are enough to take care of all the nail care needs you have. It serves perfectly for home use, spas and during travel because of its highly portable box. The tools are designed to match the manicure needs and are crafted to provide easy manicure processes so that you can achieve precision with ease. With the perfect design and high-quality materials, the tools promise to offer high-end performance for years. The kits come with a money back guarantee so that you can be satisfied after use and if not, due to any manufacturing defect you have found, you can return it without any problems. 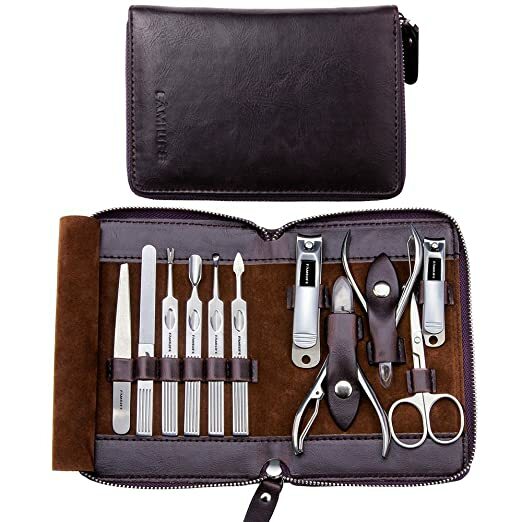 The kit comes with 11 pieces in total that include 1 nail clipper, 1 nail clipper for toes, 1 ingrown nail clipper, 1 cuticle nipper, 1 cuticle trimming tool, 1 tweezer, 1 scissors, 1 nail filing tool, 1 V-shaped cuticle trimming tool and nail cuticle pushing tool. The tools are made up of quality materials that resist rust and keep the precise shape and trimming edges so that you get the performance for years. The kits come in a portable zippered bag that is easy to carry along anywhere, in your purse or bag. TISSAG stainless steel manicure professional kit comes with the necessities that people need to keep their hands maintained with perfectly finished nails and damage free look. This kit consists of 15 pieces in total. This is a perfect little kit for any kind of foot care and hand care needs that include, nail clipper, tweezers, cuticle pusher, cuticle trimmer, acne remover filer and all that you need to take care of your hand and toenails and skin. The tools are sharpened, well-defined and perfectly edged to offer precise cuts and trimming work. The stainless steel tools are rust free and maintain their sharpness and precision for years to come. This 12 pieces professional nail care kit works for any kind of manicure needs that you might have. For keeping your nails damage free and in a good condition, you have to keep the cuticles away, treat split nails, and file them to keep the shape in its best form. For all these needs, the kits offer precisely designed, sharp tools made of rust-free quality materials. 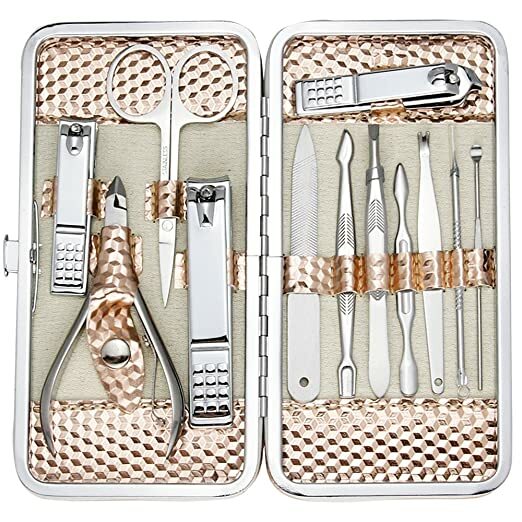 the kit consists of nail clipper and a toenail clipper, a nail clipper with a diagonal cutting edge, push stick with a single edge and double sides, a nail file, scissors, cuticle trimming tool, loop removing tool, blackhead remover, peeling blade, eyebrow tweezers, and V-push stick. All these tools are enough to provide the manicure support you may need to keep yourself maintained. The kits are portable and easy to carry in your handbag. The manufacturer backs the products and assures money back guarantee in case if you find it faulty. 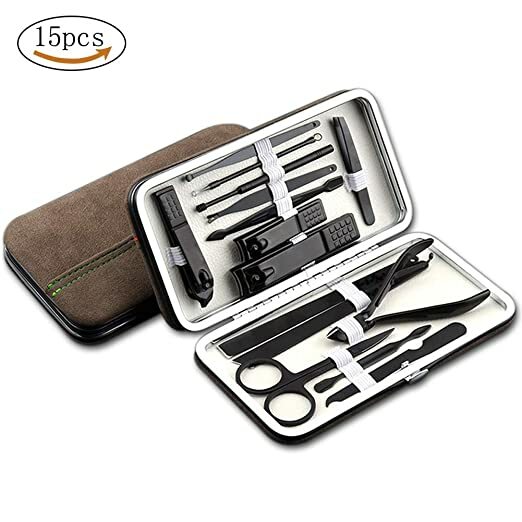 This one is another complete manicure kit that includes the necessary tools like 3 of the best-designed nail clippers, plier for manicure, filing tool, oblique blade, acne remover needle, scraper, fork for removing dead skin, ear spoon, eyebrow tools, and the perfectly designed tools make sure you can handle all the grooming tasks on your own. This helps in keeping you maintained and well-groomed either you have to take care of your eyebrows, your toenails or your manicured hands. This manicure kit includes high-quality tools that last longer, offer rust free lasting performance and are precise enough to provide easy usage. This is a multipurpose 10 pieces nail clipper manicure kit for keeping your nails groomed and for staying away from damaged nail condition. 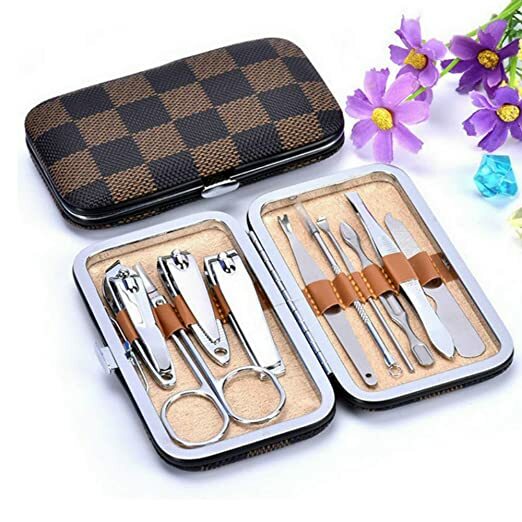 The kit consists of small nail clippers, flat nail clipper, oblique nail clipper, scissors for doing eyebrows, ear spoon, acne removing the needle, dead skin remover fork, dual head picks and nail filer. The tools are made of high-quality carbon steel that offers rust-free, durable and lasting shape and performance for grooming nails, eyebrows and some minor yet important skin care tasks. The kits come in a portable packaging that allows easy use while on the go as well. Keiby citom professional stainless steel manicure kit has all the essential tools you might need for taking care of your grooming tasks like nail clipping, dead skin removal, filing the nails and pushing the cuticle smoothly, acne removal, ear cleaning and all the minor yet precise works that are otherwise not possible to handle. The tools are made up of quality steel that resists rust and keeps the tools in the best shape with the sharpness maintained without getting rusted. The nail clippers and all the other tools are designed to match your body needs to give precise cuts and cleaning process with ease. The tools can assist in manicures, pedicures, skin care, and eyebrow shaping. This nail care kit is useful for manicure and pedicure needs when you need precise and sharp edges for accurate shaping and grooming on toenails and fingernails. 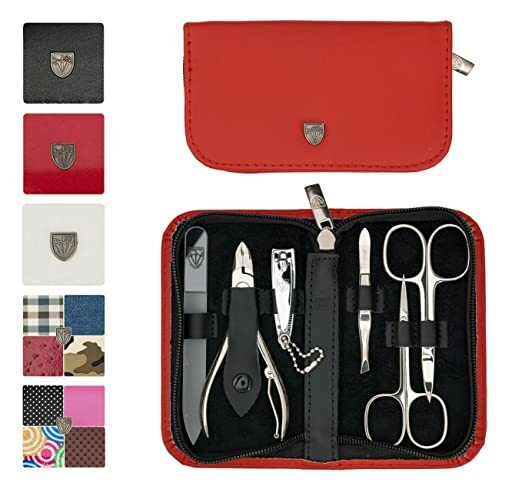 This kit offers professional grade tools for manicure and pedicure as well and is perfect if you need to take it with you in your handbag or use at home. 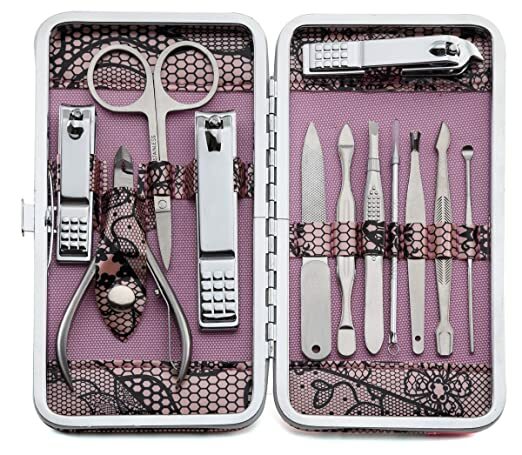 The kit includes scissors, nail clipper, tweezers, nail nipping tool, double-sided glass nail file. The nickel plated steel elements assure long-lasting tools that would not rust or break and can provide precise performance for a long time. The genuine leather case makes it is easy to organize and keep it with you wherever you go. How to choose the best manicure kit? Look for the multipurpose tools like differently shaped nail clippers, cuticle pusher, and filer along with other grooming tools for various tasks. Make sure the tools are made up of high-quality stainless steel, carbon steel or nickel plated steel materials for rust free long lasting sharp edges and design. Look for an organized carrying case to keep the kit in your bag. Taking care of your nails, skin and other grooming needs is essential to maintain a good look. These above-mentioned manicure kits serve at best when it comes to nail care and skin care needs. These are good for home use as well as for professional use to give the best results no matter when and where you need to tackle your grooming needs.